USA NJ/CA Stock, fast delivery. Shipping by FEDEX,UPS or USPS. Fully Upgraded, ROVSUN Water Distiller is the latest model on the market! The distiller is FDA&CE listed and approved. FDA(Food and Drug Administration)is the international medical audit authority, which is closely related to the lives of every American citizen. While CE certification is a safety certification, which is regarded as a passport for the manufacturer to open and enter the European market. The unit generates a bit of heat but is good in the winter time, as it'll contribute to warming your house. 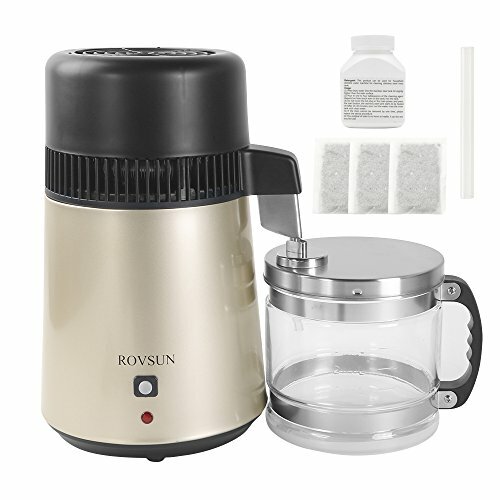 Every ROVSUN unit is well built and tested, if you are looking for quality Home Countertop Water Distiller, this is a top pick. Note: Water Bottle is inside the distiller, Filter includes activated carbon sachet. HIGH EFFICIENT: 750W heating element makes it distill water up to 1 L/H, effectively removing contaminants to offer you the purest water. And it'll auto-off when done. Save money and you don't need to buy bottled water anymore. TOP QUALITY: Fully 304 stainless steel Body / Inner tank / Inner cap / Condensing coil / Water outlet / Water inlet, Aluminum fan, Soft Catheter to prevent leakage, 4L Shockproof Glass Container with handle, all materials used are food-grade, water doesn't touch plastic. EASY OPERATION: Just fill tap water up, push the button, it'll auto-off when done. Assembly is easy and so is cleanup, no need to purchase and replace dirty filter cartridges, both distiller and carafe have large openings for easy access and cleaning. Low noise and you can run the unit overnight. 5 BONUS GIFTS: 3 Activated charcoal sachets effectively removes most tap water contaminants, Soft Catheter to prevent leakage, Chamber cleaning powder is also provided to clean the unit. 1 YEAR WARRANTY: We go above and beyond to provide the highest quality product and top notch customer service. Any problems please contact us, our team attaches great importance to the customer's shopping experience, with us you always shopping stress and risk free! View More In Under-Sink & Countertop Filtration. If you have any questions about this product by ROVSUN, contact us by completing and submitting the form below. If you are looking for a specif part number, please include it with your message.